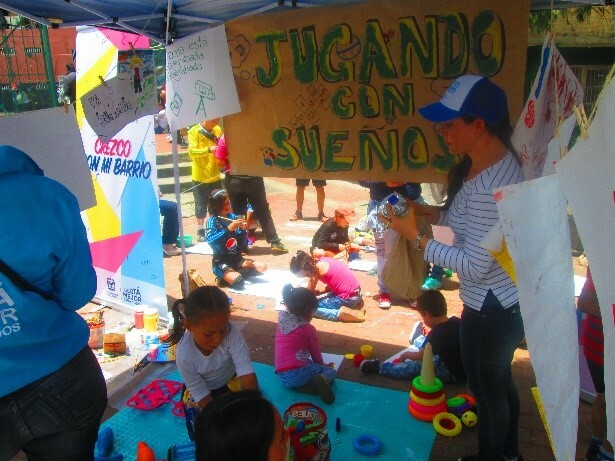 The first Urban95 Crezco con mi barrio (“Growing with my neighbourhood”) experimenting exercise took place on Sunday October 1, with the purpose of giving public space back to the people – particularly young children and families. The street leading to the football pitch in la Acacia, in the Ciudad Bolivar area of Bogotá, was closed between 10am and 3pm. The government programme Va jugando (“Go play”) organised a football tournament, while children and their families were invited to join other games and activities laid on in the street. 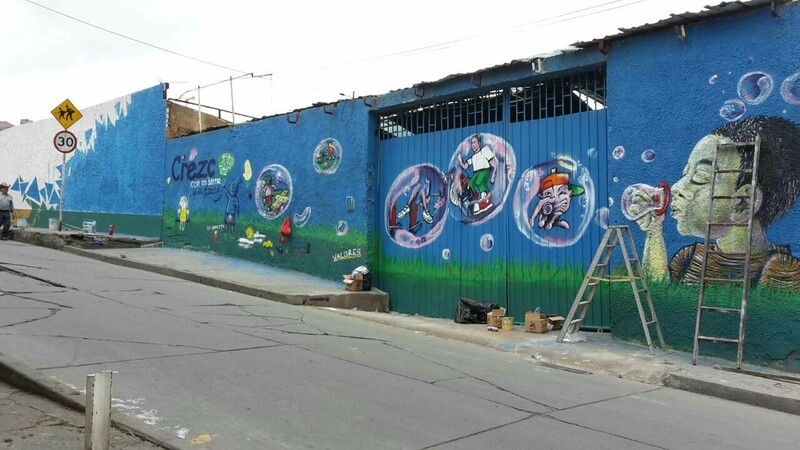 Young artists from the neighbourhood painted a graffiti mural, honouring early childhood by depicting the games they remember playing on the streets when they were small. From the symbolic height of 95cm down, the wall was decorated with images painted by young children at the “Playing with dreams” stand, where toys and artistic materials were made available. During the day, around 40 children visited the stand and made paintings to be exhibited. In all, around 300 people of all ages participated in the day’s activities. We asked the children to paint their dream community. Interestingly, we noticed that most initially had limited capacity to imagine any public space different to the one they currently live in, and mostly drew a football field. 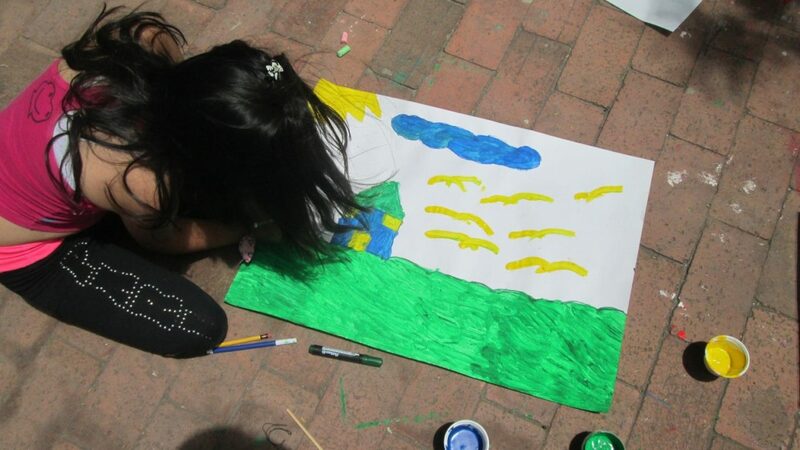 However, when we encouraged them to experiment and use different artistic supplies, more dreams started to appear, showing various kinds of green spaces and play areas. We also observed that the stand led to quality interactions between children and their caregivers, who in many cases where not just passive company but active participants, playing and painting with the children. They were mainly young fathers and grandmothers. The atmosphere was warm, with many of the participants observing that the event was good for the community and asking for more activities of this type. The exercise was organised jointly by Casa de la Infancia and local institutions including the District’s Secretary for Social Integration, the District’s Institute for Recreation and Sports, and the Communal Action Committee. You can read more on the local administration’s website. Casa de la Infancia is a non-profit organization that seeks to advice, develop and execute projects and programmes that stimulate personal, social and family development. Their approach is divers and inclusive and they accomplish their goals through education, culture, integral health, the use of technologies for communication and information and urban development. They work with national and international organizations, both private and public, families and different natural and legal persons.